The lead time for PCB Assembly orders is around 7-15 business days if all the parts are from the Seeed's OPL and around 20-25 business days if not. Components from Official Suppliers like Digikey, Mouser, Arrow, Element14 and others. 3). Must be available in small quantities or in the specified quantity. 1 We can assembly both sides (Components can be soldered on the top and bottom sides). 2 If possible, please provide us with a pick and place file (XY or Centroid file) in the PCB Gerber zip file. 3 Shipping is FREE to anywhere in the world for PCBA orders. 4 Stencils are included in PCBA orders but they are not shipped with the boards due to the high shipping costs. If you need stencils, please order them separately. 5 If possible, please keep all through-hole components on the same side (top or bottom). 6 The distance between 2 solder pads of 0402 components should be 0.26-0.45mm. 7 Please ensure that designator labels on the silkscreen are not on top of pads or vias since any overlapping silkscreen is removed during PCB manufacture. 8 Please clearly mark the pole for polarised components. We can not only solder components from our OPL but also can solder components from other suppliers, like Digikey, Mouser, Element14, Arrow and so on. 1). The MPN is the 'manufacturer part Number', NOT the Digikey or Mouser part number. 4). Our system will automatically recognize the BOM file as long as you follow the BOM Template as shown below. The lead time for PCB Assembly orders is around 7-15 business days if all the parts are from the Seeed's OPL and around 20-25 business days if not. Please see below for details. PCB in production: PCB is being produced (3 - 14 business days, see note 1). 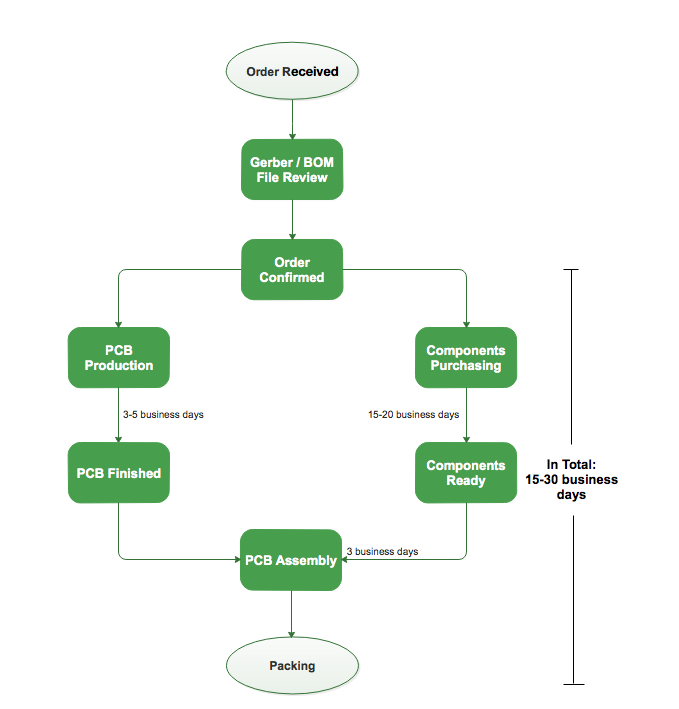 BOM Processing: The procurement of components and other materials (around 18 business days from order confirmation). Assembly: The boards will be assembled and shipped 3 business days. For Non-OPL orders: Since PCB production and components procurement take place at the same time, in most cases, the components will arrive after the PCBs have been manufactured. Therefore, the lead time for Non-OPL orders is time for components procurement and assembly/shipping time. 2. PCB production takes 3 - 14 business days depending on specific order parameters, not including delays caused by problems with the order/files, but typical boards are completed within 3 to 5 days. 3. We strongly advise customers to place orders well in advance of deadlines in case of any delays caused by problems with the order/files. The designator on the PCB should be complete. Without the designator, we are not able to know the locations of the components precisely. Please put the Component Placement file as PDF with the Gerber file in ZIP/RAR and re-upload it if there is no designator on the board. The component package in the uploaded BOM should match the pads in the Gerber file. Polarised components should have clear indications to their polarity on the silkscreen. Otherwise, the components may be incorrectly mounted. The component quantities in the uploaded BOM should match the number of designators. Notice: Please examine the files carefully before placing an order. We are not able to change the Gerber files once PCB fabrication begins.